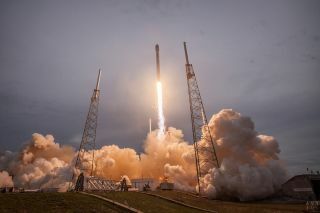 SpaceX's Falcon 9 rocket launches on April 27, 2015, from Cape Canaveral Air Force Station in Florida, carrying Thales Alenia Space's TurkmenÄlem52E/MonacoSat satellite to orbit. SpaceX has signed two new contracts to launch communications satellites a few years from now, the company announced Monday (Sept. 14). SpaceX will loft one satellite for the Spanish company Hispasat on its Falcon 9 rocket and launch Saudi Arabia's Arabsat 6A spacecraft on a Falcon Heavy. The launches will take place from Florida's Cape Canaveral Air Force Station in late 2017 or 2018, SpaceX representatives said. Hawthorne, California-based SpaceX now has more than 60 launches on its manifest, with a total value of more than $7 billion, the company added in the new announcement, which was made at the World Satellite Business Week conference in Paris. "We are pleased to add these additional launches to our manifest," Gywnne Shotwell, SpaceX president and chief operating officer, said in a statement. "The diversity of our missions and customers represents a strong endorsement of our capabilities, and reflects SpaceX's efforts to provide a breadth of launch services to our growing customer base." One of SpaceX's customers is NASA. The company is flying at least 12 unmanned cargo missions to the International Space Station using its Dragon capsule and the Falcon 9 under a $1.6 billion deal with the space agency. The first six cargo missions were successful, but the seventh ended just after liftoff in late June when the Falcon 9 exploded. The accident was apparently caused by the failure of a faulty strut within the rocket, SpaceX representatives have said.